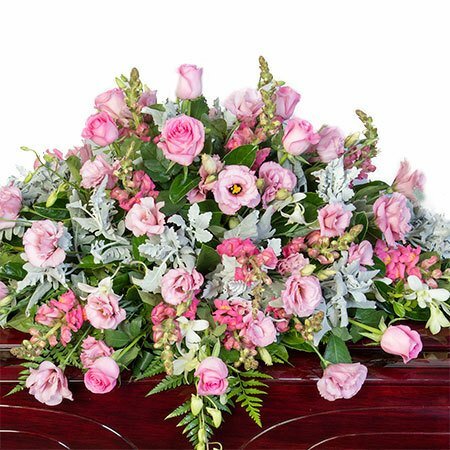 A delightful floral arrangement for a funeral casket, this design features a beautiful combination of pink flowers including roses and seasonal blooms such as lisianthus and snapdragons. Mixed with lush foliage in green and silver tones, this traditional casket flower arrangement has a soft, feminine `garden-like` appearance. You can order these funeral casket flowers online or by phoning our helpful consultants toll free on 1800 66 66 46. 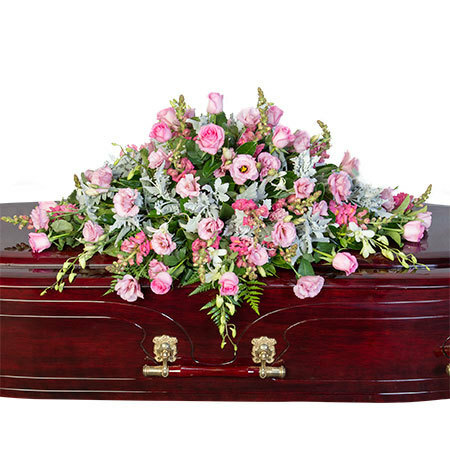 *Please note: The pictured funeral casket flowers are exclusive to Sydney funerals only. For casket flowers outside Sydney, our team will coordinate your order via an affiliate florist network to recreate our design and colours as closely as possible.